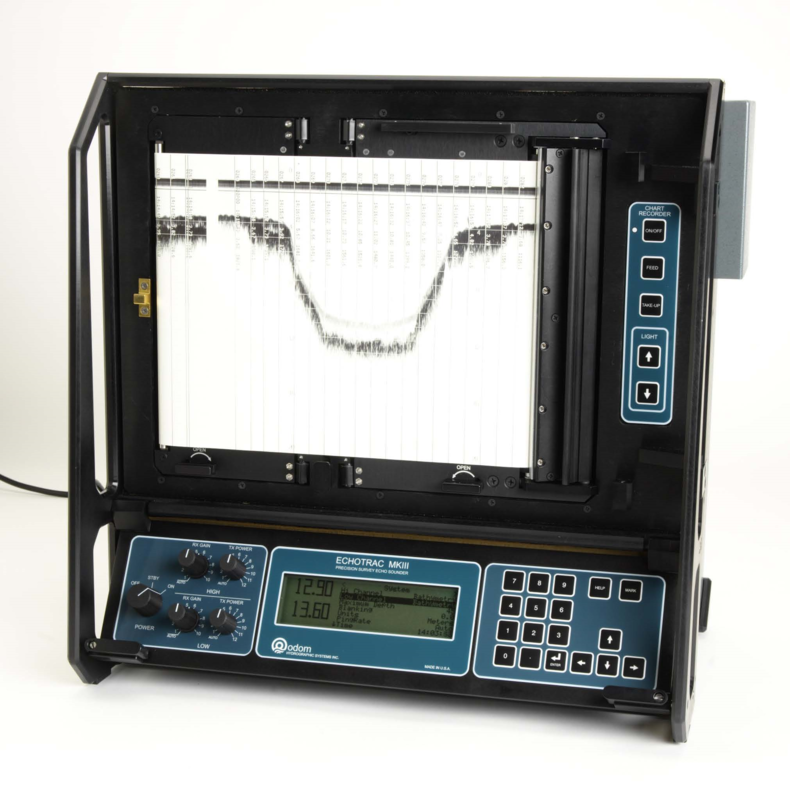 Most echo sounders these days do support their own proprietary output format, as well as the more standardized NMEA0183 protocol. 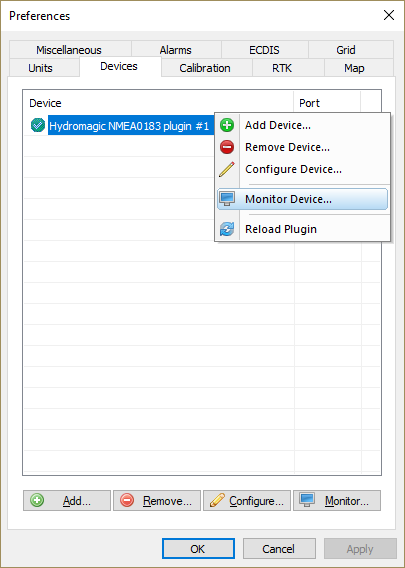 If your echo sounder does not support the NMEA0183 protocol, you should be able to configure it using one of the plug-ins shipped with Hydromagic. you can add a serial port by using an USB-to-serial converter or a NMEA0183 data combiner equipped with an USB port. Some newer models might have the ability to connect them via Bluetooth. When using an USB-to-serial converter, make sure it is connected at the time you are going to configure the sounder. When using Bluetooth, make sure the device has been paired and connected with your computer. Because an USB-to-serial converter can cause minor (some brands major) delays (latency) in communications, we recommend to use a multi port serial adapter instead. Multi port serial adapters are available as PCI cards as well as PC-Cards for use in laptops. In addition to NMEA0183 data over a serial device, Hydromagic is able to read NMEA0183 data over TCP/IP connections. This allows you to transfer data over, for instance an Ethernet or WiFi connection. Both TCP and UDP protocols are supported. In addition to the communications setup, you also have to check the echo sounder offset configuration to enter the offset between the transducer and the waterline. 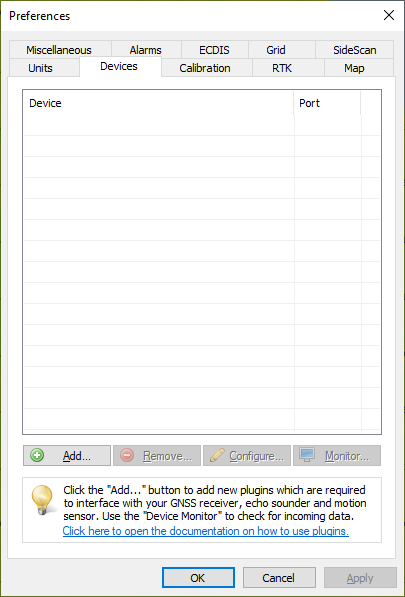 In the devices tab, click the "Add..." button to load a NMEA0183 plugin. You can load a maximum of four NMEA0183 plugins at the same time. After the plugin has been loaded, a configuration dialog is displayed where you can pass the required information to the plugin. 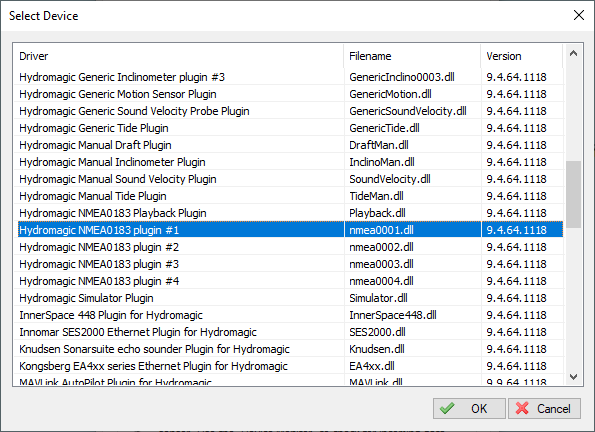 The NMEA0183 plugin supports two types of connection types: serial and TCP/IP (networked). 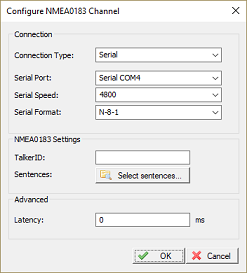 When a device is connected through an USB or serial connection, you have to select the "Serial" option. 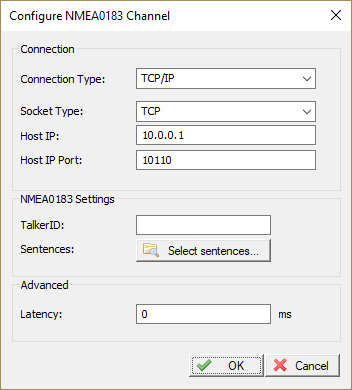 you have to select the "TCP/IP" option from the "Connection Type" drop down box. selection boxes in the "Connection" section will change as can be seen in the two screen shots above. Use this drop down box to select the COMxx number of the serial port the device is connected to. This can be either a regular serial port, or a virtual serial port, which is used by USB to serial and Bluetooth adapters. 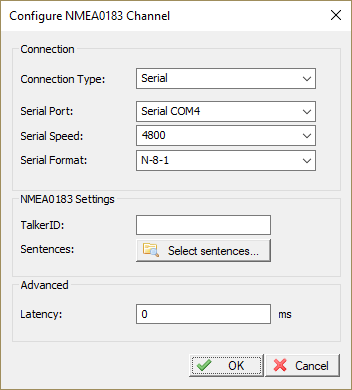 The default serial baud rate for NMEA0183 devices is 4800bps. However, some hardware is using other speeds (for instance, an AIS receiver will use 38400). When configuring an echo sounder, the serial speed can sometimes deviate from the standard. 4800, 9600, 19200 and 38400 bps are mostly used on these devices. You can leave this setting at it's default value. Devices that use NMEA0183 protocol with other settings are very rare. Use the "Socket Type" drop-down box to select the TCP/IP protocol used. Possible values are "TCP" and "UDP". Please refer to the hardware vendor on which option is supported. Most devices support both protocols. The IP address of the device. This value is required only for TCP connections. For UDP connections, just provide a valid port number. Enter the IP (TCP or UDP) port number the device is listening on here. For most wireless NMEA0183 devices, the port 10110 is used, which is the reserved port for NMEA0183. (for instance a position fix, or depth) and when the serial data is received by the application. If this value is know for a certain device, you can enter it here to get more accurate soundings. 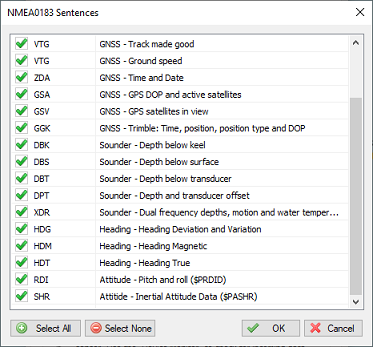 Use this option to filter NMEA0183 sentences by talker ID. in this case you can either select the GPS or echo sounder by specifying "GP" or "SD" in this field. click the "Select sentences..." button. The dialog that appears allows you to select which sentences are used. For most echo sounders devices, it is safe to select all sentences since most of the times only one sentence is used. When the depth values starts flipping between two values, most probably the echo sounder is sending both DBS and DBT sentences. In this case, use either DBS with echo sounder draft set to zero, or set the draft and select the DBT sentence only. When everything has been configured correctly, and the sounder has been switched on, depth field in the "Navigation View" should display a depth value in green. You can always check whether data is received correctly, by running the built-in communications monitor. 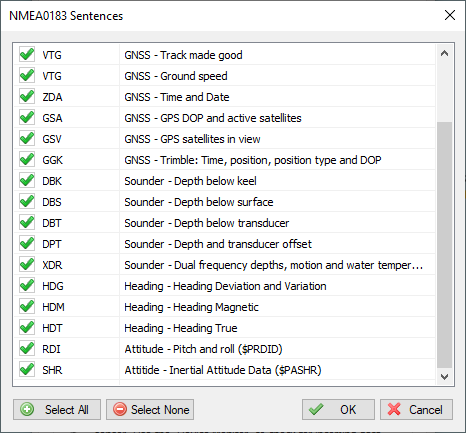 Not even can it used to check if data is coming in, but you can also see which NMEA0183 sentences are received. When data is garbled and you are expecting NMEA0183 data, you have to change the serial baud rate until the data is readable. To start this monitor, select the "Preferences..." option from the "Tools", and select the 'Devices' tab. Right click on the device you want to monitor the incoming data from, and select the 'Monitor Device...' option from the pop up menu. When the monitor is running you should see NMEA0183 data coming in. You can pause the data at anytime. For technical support purposes, you can click the 'Copy to Clipboard...' button to copy and paste the incoming data into an email.